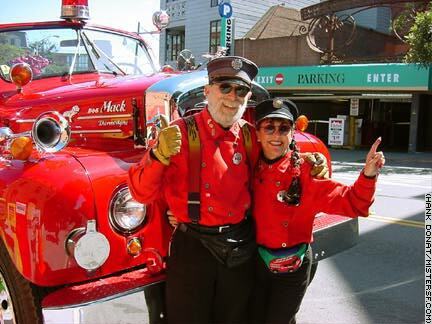 Robert and Marilyn Katzman operate the San Francisco Fire Engine Tour. Their big, shiny, red '55 Mack seats 13 for a ride through sights of the City such as the Palace of Fine Arts, Golden Gate Bridge, Presidio, Fisherman's Wharf and more. Traveling across the bridge in the back of an open fire engine is a truly unique experience. The Katzmans, who live in the renovated San Francisco firehouse that once housed Engine 33, are dedicated to preserving the history of the fire department. The Katzmans bring their love of the City to the business, which helps make theirs one of our most popular tours. The tour is informative, yes, but also incredibly entertaining. (When she's not cruising over the streets of San Francisco with Captain Robert, hostess Marilyn is a record holding tap dancer who's tapped across and atop the Golden Gate Bridge!) The Katzmans' affection for the City and for each other is obvious. They're great friends to our fire fighters and a fixture in the Marina as a bright red streak in the passing parade.